Last week I hosted our ninth Blue Prism Café, with Naresh Venkat, AI Business Development & Strategic Partnerships at Google Cloud and Vivek Khurana, Global Automation Service Lead for Pfizer. Naresh drives the Google and Blue Prism partnership focuses on drive adoption of AI and intelligent automation in the enterprise, with many exciting Google AI capabilities being shipped in the current Blue Prism product. Vivek is on a fascinating journey to optimize and evolve Blue Prism’s Digital Workforce Platform in a highly regulated operating environment. Over the session, we tackled the big question on everyone’s minds — how can we take the next step with process automation to make digital work more intelligent? An exciting discussion indeed. What is becoming very clear is that we are undergoing seismic business change across the workplace — with both routine and non-routine based tasks already being transformed by automation. To keep pace with this, we are already seeing a shift from rule based decision-making automation to a more advanced judgment and self learning-based intelligent automation. This evolution means more intelligent, digital workers with new skills that include knowledge and insight, planning and sequencing, visual perception, collaboration, learning and problem solving. These skills bring the thinking and the analytical capability to make operations smarter and autonomous. And this is no longer a theoretical scenario and is occurring now — as we move from humans consuming data — to machines consuming data and then executing on new, rethought process. This shift in gears is being achieved by blending automation capabilities, and delivering it in a manner, as the only vendor in the market doing this, where the customer has a choice with the most innovative cognitive and AI technologies on the market from vendors that include; Google Cloud, Microsoft and IBM. However, many are still confused about how AI is defined in the context of automation. Google Cloud’s take on this is interesting; Naresh thinks the best way to describe it is if you think of AI as the vision — and machine learning as the tools. So, AI is where you’re trying to replicate what a machine does in the most appropriate and most efficient way and machine learning is the tool you’re using to do it. 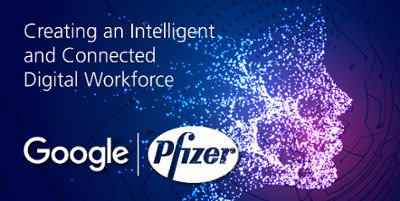 Vivek provides some excellent insight on the potential of automation and AI gained from within his own highly regulated, operating environment at Pfizer. He is seeing a shift from pure, rule-based, decision making automation — to a more advanced, self-learning, ‘intelligent automation’ — which is driven by AI. He sees AI as ‘intelligent assistance’ — namely a set of capabilities that are used to solve complex business problems. The basis of this — which is a combination of audio recognition, image recognition, or natural language processing — is already being applied en masse at Pfizer. One of many areas that are driving Blue Prism forward is an exciting tech innovation partnership with Google Cloud. The first initiative is providing access to the best of Google Cloud’s data sources to satisfy the ‘big data’ needs of Blue Prism’s users. The second involves easy access to Google’s AI APIs that include Vision, Speech and Translate — from within Blue Prism’s Digital Exchange platform. The third initiative is integration of machine learning engine into the workflow. This is where workers can directly feed data into the Google Cloud machine learning engine and use that training data to perform statistical analysis. This gives users the ability to build their own machine learning and prediction models — right from within Blue Prism. To make it easy for users to access these services, Blue Prism has also created an authentication integration system. From an adoption perspective, Google Cloud’s Naresh believes that RPA is perfectly suited for injecting machine learning into business processes. In fact, to achieve natural language processing in an email automation flow, it should be as simple as a drag and drop and a couple of clicks. Several real-world use cases and examples using artificial intelligence are cited that include invoice automation support and using sentiment analysis for automating support calls and tickets. Another interesting area is the integration that Google Cloud has done with Blue Prism on its cloud machine learning, which is unique and can potentially enable non-deterministic decision-making process too. Ultimately, it’s all about understanding data. The central core for intelligent automation is bringing data sets together from various disparate systems that exist in an organization, then when AI and machine learning is added, an outcome is achieved that couldn’t have been done without those data sets. In fact, insights can be derived from the data and used to drive automation and change the way people do things, or work is done in the workflows — in interesting ways. In a word, no. But the key here is for humans to responsibly guide the development of machines and AI systems – step by step – and not just from a technology standpoint but also from an ethical standpoint too. Ultimately, we are going to partner with machines to better secure our well-being and create a better future. What are some ways AI can be implemented into business practices – other than machine learning? AI could simply be a rules-based piece of code that’s looking for specific things in a piece of document and there’s a specific action – without involving machine learning. AI is very probabilistic, so a simple script could be written which looks for specific patterns in files. There are a lot more capabilities too like audio recognition, image recognition. These features are very powerful, they’re already in current devices and can now easily be deployed too. Also, consider tech bots that can now be talked to as if they were human. They can also pull in content from the right sources to be able to determine intent and then point people in the right direction. How can you use AI where sufficient datasets aren’t available to train the model in newer organizations? This depends on what kind of AI is being chosen. It may be worth trying off the shelf APIs, which have been pre-trained with datasets from Google Cloud – then as the accuracy of those models is improved, data can be fed to create customized models. However, when building customized models, humans must be in the loop and the feedback process. As new datasets come in, they can be fed data so they learn from the original one. Look at the output of that and then use it to make new data to improve and deploy on that model. Can you give examples of how you can scale up the use of AI with RPA? At Pfizer, we’ve seen several used cases where we do attended automations or we’re using human judgment to do a parallel check after the machine has proven the insights. So we add that as an additional step in the workflow just to validate – before we actually start making decisions based on that. There are several strategies that you can use to scale up. We do a lot of proof of concepts to pull out the technology before we actually get those things in production. Why did you select Blue Prism and how did your first RPA install go? Quick recap of your experience and lessons learned. We went through a detailed process when selecting Blue Prism. We interviewed several technologies on multiple parameters and were looking for an enterprise scalable platform that could be handled in a regulated environment – with all the audit control that we needed. I got tremendous help from Blue Prism while doing the install. Obviously, we used our partners to do the install and to get it validated. They’ve been phenomenal in helping us through this. There’s a lot of learning too – especially around the realm of the delivery model itself. We were able to expand on the helpful templates and model to improve and validate – so we are now certified for GxP and SOX. If you haven’t heard of that term from a pharma or healthcare company, it needs a lot of work to gain compliance and we eventually achieved it. There are two key takeaways that can be highlighted from our session. Firstly, artificial intelligence is intelligence assistance. Its aim is to make human life easier — so we can focus on higher value work. Secondly, AI is a set of capabilities that is still being developed, the technology is maturing but I think it’s going to be phenomenal as we go forward. On a final note, the 6.3 version of Blue Prism is coming out with additional goodies that Google Cloud has to offer. So, plug in and give us feedback. We would love to hear from you on what works, what doesn’t work and how Cloud AI is helping process automation.